Visual Composer takes care of responsiveness automatically, meaning you don’t have to worry about how your content will look on mobile devices. 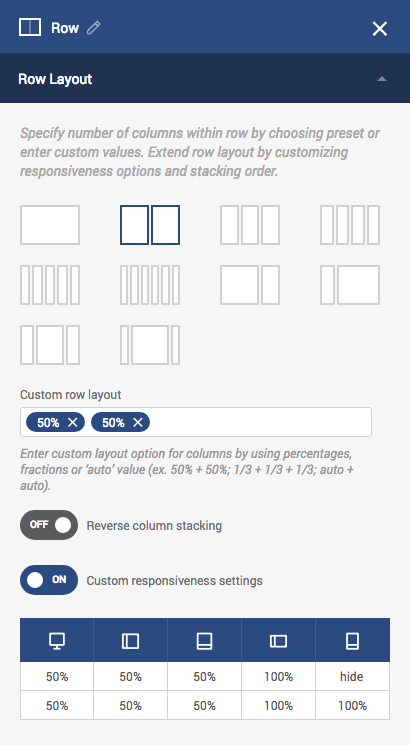 Rows and columns use the default responsive stacking where columns become 100% wide within a row. Nevertheless, there are cases when you simply need a little bit more control over responsiveness. For example, you simply need to have 2 columns side by side on the mobile devices. Or maybe you want to hide a certain column on mobile or desktop. Adjust values of the table based on your preferences. Note: Use ‘Hide’ option to hide the column on a specific type of device.